Happy Birthday, WordPress — and thanks for the great blog resources! When I woke up this morning (I slept in — luxury! 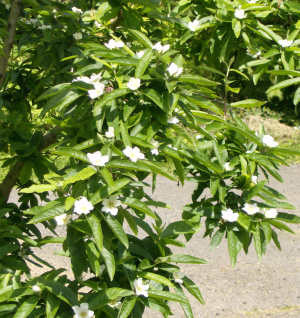 ), I noticed there were white spots all over the medlar. Sure enough, it’s in bloom all of a sudden! 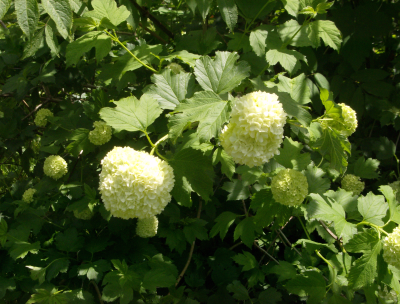 And the snowball bush has REAL snowballs again (though still a bit green). 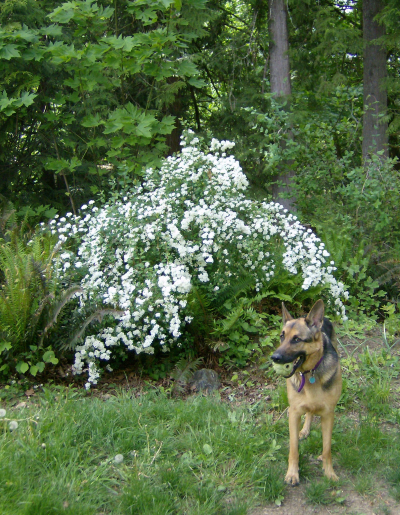 And the other white-blooming shrub today is the bridalveil spirea in the back. You can see it next to my Lucky boy for scale. This is the first year it has done so well. The pretty orange cream-sicle poppy is also blooming now, but I didn’t get a good pic when the light was right. Will have to try again soon. It blooms from now until frost! This is the tulip that I accidentally knocked off its stem last week. I put it on the kitchen windowsill, and it really brightens the space. The pretty blue dolphin is a box the elder stidkid made me last year. And a somber note, the nectarine’s leaves were truly shriveled and it just looked sick. So Tom put it out of its misery this past weekend. I am very sad, but rather than have the virus spread to the still-okay peach, I thought it best to cut it now. 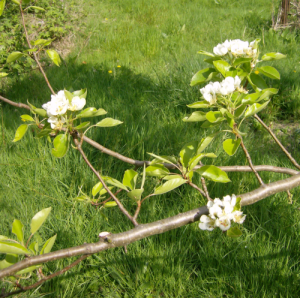 It’s much too late in the season to try to spray for control, and since the entire tree was involved (last year it was just “most” of the tree) I couldn’t just cut the affected branches or collect the few affected leaves (as I did with the peach last year). and fell in the summer. The termites are flying. Big, ungainly, black, ant-like, winged reminders of the real rulers of the earth. I had the budgie outside for about an hour just now — it is sunny, but in the way that includes the high-cirrus clouds, the wispy ones that come when it’s humid. Which it is today. Very sunny. The current humidity outside is 59%. It’s about 25 C… 77 F. Which is not as hot as they said it might be. I think the clouds helped deflect some of that heat back into space. And I just came in from walking around the yard. As I expected, the nectarine’s leaves are completely shriveled already. 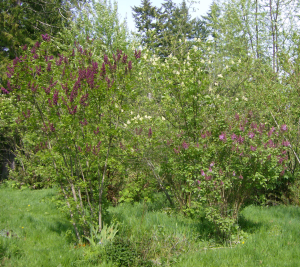 I will have to cut it down this year. Maybe this weekend. Next weekend at the latest… Which makes me sad. I really like that tree. 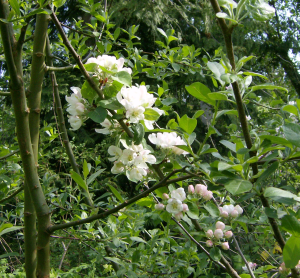 The remaining peach tree, however, appears healthy at the moment. 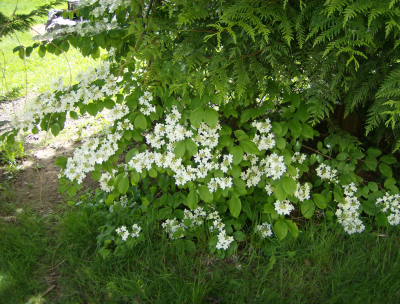 Other sights around the yard… the cherry tree in FULL bloom. Here are just the branches. I really hope the bees are out and about this weekend! 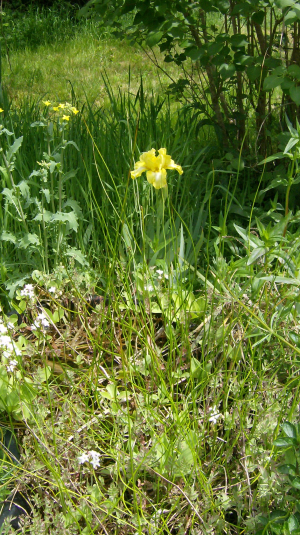 A yellow iris. Apparently the only one that will bloom this year. Will need to investigate to see what happened to the others. 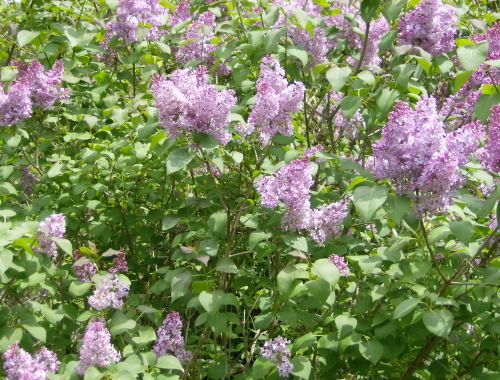 The lilacs — light purple and the tall, dark purple one, and yes — they smell wonderful! 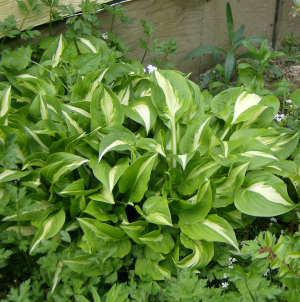 The hosta at the north end of the house, a lasting reminder of my friend and neighbor who died a couple weeks ago. 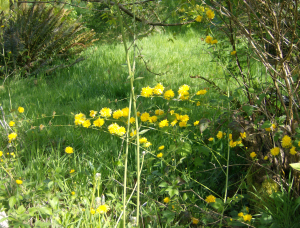 He brought me several wheel-barrow loads of plants as he divided them the first year we lived here. Thank you again, Murray. The rose he gave me at the same time, I call it Lois’s Rose (I don’t know its real name) in honor of his wife who died just a few months after we moved in, is not blooming yet — not even budding, but I love the way the leaves come in a deep, almost-purple burgundy and change gradually to a lovely dark green with red veins. 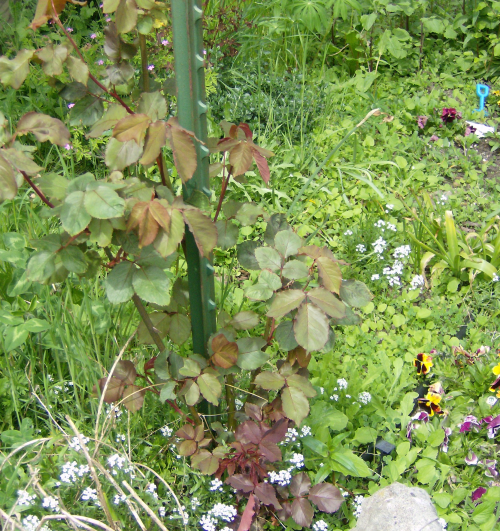 Finally, the little garden that I hope I can get the elder stidkid to weed tomorrow. 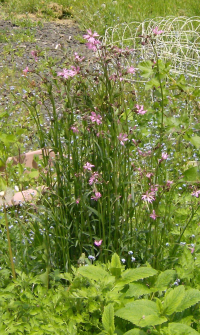 I took a separate pic of the lovely “ragged robin” my mother in law gave me a few years ago. 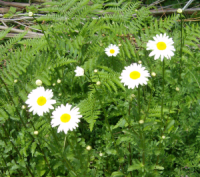 It is a spectacular plant. 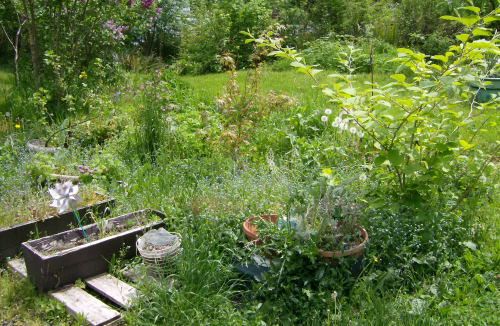 More so, when you can actually see it (If you are the first person to tell me where it is in the pic of the whole garden, I will make a stepping-stone with your name for my garden and post a pic in this blog) ! I do love the forget-me-nots in this bed, too. That’s it for today… will be picking up kids for a shopping trip into town, and dinner at a restaurant. Too hot to cook! 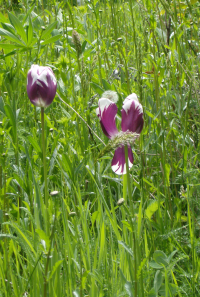 the “Ragged Robin” is a “Lychnis flos-cuculi“, related to the rose campion, and apparently highly invasive in the right locations and conditions. Thanks “FMitch” of Babbleland who ID’d it for me! My brilliant kids… and their great performance! Okay, proud mama moment… this is one of the songs the kids played last Saturday at the local school’s Spring Swing. Sorry about the picture quality, and the sound isn’t that great either, because the battery on the video camera went dead and I finished recording the concert on my little Photosmart camera. Unfortunately, in the strange light, I didn’t get a good still shot of the kids! This piece is called “Woodchopper’s Ball” by Joe Bishop and Woody Herman. I only have a partial recording, the one that is full-length is too big to upload. But it’s a good one. There are people talking in the background, which is fine, since this is “cabaret” style: dancing and dessert! This is one of the highlights of my year! These were actually taken the day after the tree pics, but I am only just getting them pulled together! It has been a busy week (again). These first two are the pretty Lewisia in the stidkid’s rock garden. Later in the year, they stop blooming and the plants in the cement blocks begin. And this one shows the bluebells and sweet woodruff that are just behind the rock garden. I love how they look together! I want to boast about the later-blooming fruit trees: cherry (might actually produce enough for a pie this year), pear, apple and nectarine (though not much hope for fruit there… it has peach-leaf curl). 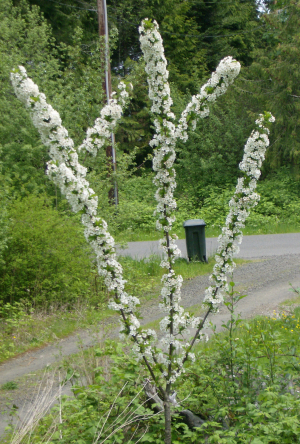 Here are a couple pics of the blossoms. You can tell the family resemblance, I think! From the top: the european pear (it’s a 3-in-1, no idea which this is), an apple (a 4-in-1, same story), and an Asian pear, I think this is the Ichiban. 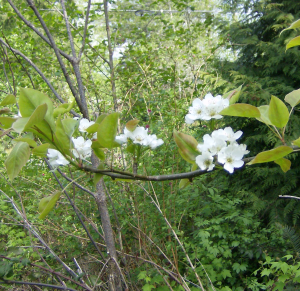 The cherry is too tall for me to get a good picture without a ladder… but still rather spindly with only a central leader and two side shoots. As I walked back toward the house, I saw that my favorite poppy, the one I like to call “orange cream-sicle” is about to bloom! 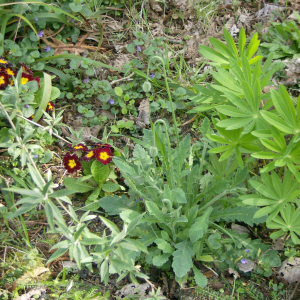 you can see it just to the right of the deep red primroses, to the left of a lupine that will need to be pulled. 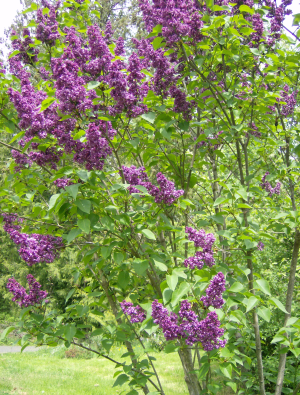 Closer to the house, the lilacs are about to burst into full color once again. The white elderberries behind them (actually growing up in the middle of a large filbert bush) look spectacular this year! 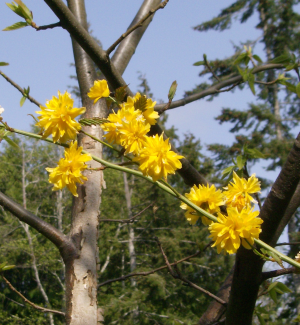 A couple more “beauty spots” in my yard: the japanese double golden kerria… eventually the suckering action will cause it to look like a huge shrub, but you can see it’s actually just canes with blossoms going up the sides. The second picture is a close-up of the blooms, and you can see how the chestnut’s bark is peeling, just as it’s supposed to! 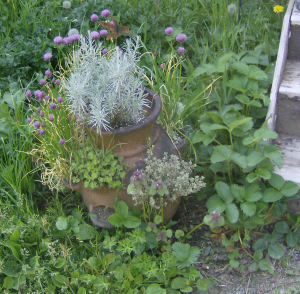 Finally, as I re-entered the house, this is what the strawberry pot looks like: strawberries around the base (they wouldn’t grow in the pot) and assorted herbs in the planter: thyme, chives, tarragon and marjoram. YUM! Spring may really be here now! Here is a slightly updated look. On my browser, the light green and pink on the side works well with the new pink (I did change it a bit to make it less peachy-orange) of the header. I also changed the link and heading color from a dark peachy-pink to green. I like the way it reflects a more spring-time color palette. If it doesn’t look good on your browser, please let me know. And if you like, you can try contacting me through a new page I set up at a new idea for people who want, or want to extend, a web presence: stidmama at yougler… and let me know how that works for you also! TOO MANY people these days are afraid to get involved. Too many people suspect things are not right in various places and don’t investigate further, don’t ask authorities to check, don’t keep an eye out to verify or disprove suspicions. The rest of this is an emotional rant… read on if you dare!